Brain and Neuron Harley, progress so far. 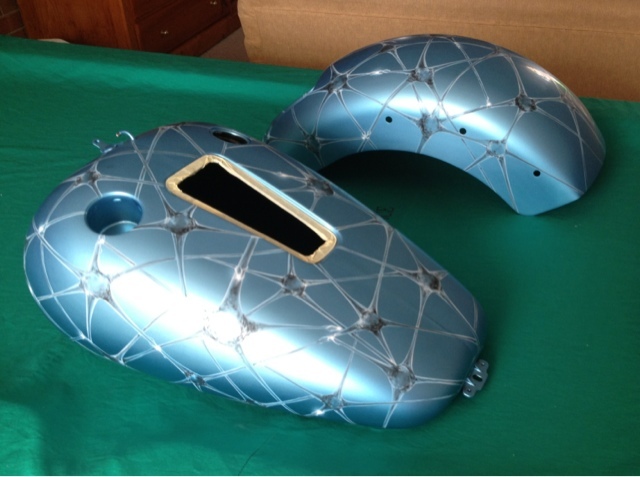 One of our most involved projects to date since we airbrushed the World War Harley. The pictures shown depict only the background so far. The neurons have been drawn freehand and then cut using an xacto knife on application tape which we wrapped all of the parts in, so that it would act as masking. 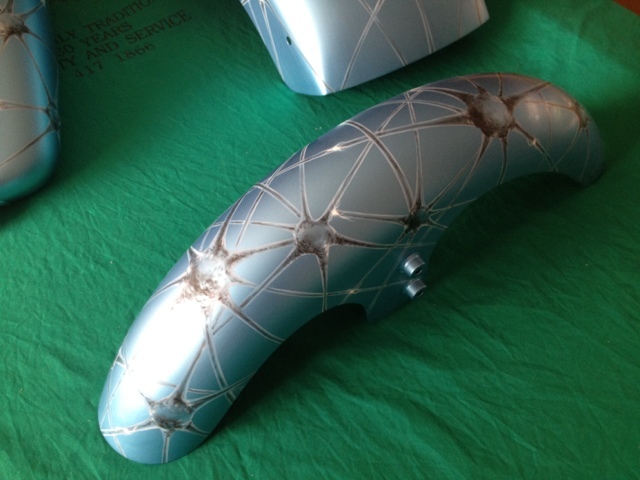 Now that all of the neurons have been completed and rendered, each part will now receive a blue candy as chosen by the customer, this will tint all of the artwork that you see here with a blue tinge and give the effect that the neurons are trapped within the base Colour of the bike. After the completion of the Candy the next step is to airbrush all of the other murals which will make up the foreground. Einstein electric bike battery cover. Electric bikes are becoming more popular with rising petrol prices and now you can customize your bike to make it unique and stand out from the rest. 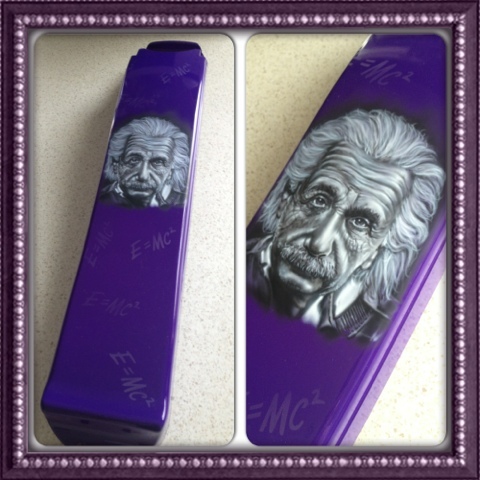 Pictured here is our latest battery cover with Einstein mural airbrushed freehand in B&W over a purple base with e=mc2 airbrushed with white pearl over the entire cover. The Long Room body painting for Harvey Norman and Map Coffee. The night was a great success, with many of the representatives from both companies blown away by the body paint. The two girls were airbrushed in a total of approx 3 hours with Wes & Myself working on different aspects of the designs on both girls. Both designs were based on Body suits, with the Harvey Norman logos on the Blue background and also within the 'Bangs' on the girls arm & leg. Map Coffee received a Black bodysuit with Italian Maps airbrushed to represent a pattern in the material, Map coffee logos and even a cup of hot coffee airbrushed on the models back. Things have been really going crazy here at Airbrush Asylum, we have been designing up some exciting projects which we will begin airbrushing soon. The Brain & Neuron Harley should be getting started late next week with plenty of artwork being airbrushed as a background which will then be Candied over and then more murals over that....it's going to be a huge task but an impressive Harley when it's all said and done. We have some Crazy looking streetbikes that we will be working on with some yet to be confirmed artwork, but it's looking like the R1 with a crazy looking custom 'single sided swingarm' and a 360 rear tyre, will be getting a B&W Grim Reaper with wings airbrushed up either sides of the fairings from front to back of the bike. The other streetbike has some lettering confirmed for the rear and a combo of Matt and Gloss black paint for the base, with the possibility of a silhouetted Heath Ledger 'Joker' airbrushed on either side of the bikes fairings....artwork at this stage yet to be confirmed, but fingers crossed as these two projects will be some killer looking streetbikes. 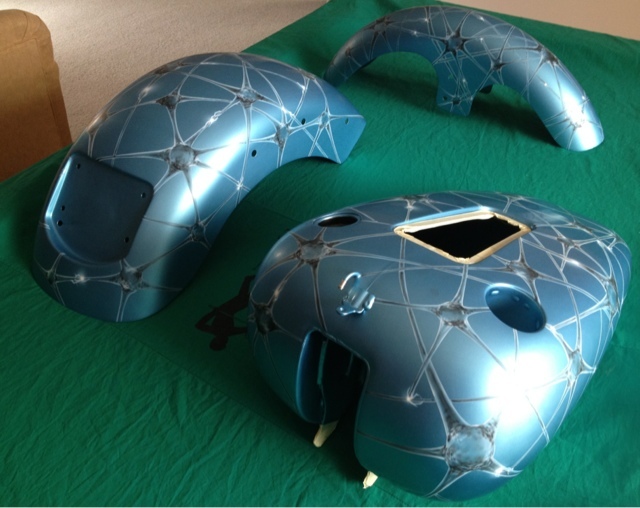 Apart from the brain & Neuron Harley, & the streetbikes... we also will be working on another Harley which will be airbrushed with real fire and skulls in either green or blue Candy....once the customer confirms.